Besides having a grandparental visit for the past week or so, we also made it through a round of doctors' visits this week. The Baby now weighs 14 lbs 9 oz and is 24 inches long -- which puts her in the short and chubby category, as if that weren't obvious just by looking at her. She put up with her shots really well and didn't spend too much time berating me for the betrayal. We met with a pediatric dermatologist yesterday. Like our pediatrician, he's pretty conservative and not hepped on getting out a scapel and carving on my child, nor is he planning on shooting lasers at her or giving her steroids. None of those hemangioma treatments appeal to me at this time, knowing that it is still growing and knowing that it will almost certainly go away eventually. Once the hemangioma stops growing at about 12 months, he wants to see us back and he did tell us about one procedure that we might consider at that point, although we may well leave the thing alone. They put the baby to sleep, make a tiny incision in the hemangioma and use a laser or something inside of it to kill it off without harming the skin on top. It sounds like it might be a good thing, but then again I want to study up on it a lot more. The dermatologist also told us that The Baby's hemangioma is of a type and shape that usually -- eventually -- disappears with almost no trace -- but the wait until age five to seven is a lot to ask of a child -- not to mention me. Right now though, we are waiting and watching and praying. We've got at least eight more months to think about where to go next. I am so glad to hear that your doctor visit went well too... It is so tough to wait for news of a medical nature. 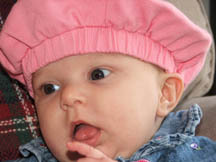 the baby is adorable and looks charming in her hat. Hope the visit with your dad went (is still going?) well!